The European Project NIMBLE is framed within the actions proposed by the European Commission to bring the Industry 4.0 concept to the companies, from an integrated and homogeneous perspective. In fact, the NIMBLE initiative bases its schema in the architecture used in Industry 4.0 to develop its solutions. The metal-processing, furniture, wood and packaging technology institute AIDIMME, the federation of wood and furniture companies of Valencian Community FEVAMA, and the childcare furniture manufacturer MICUNA, have participated in the NIMBLE project presentation, composed of 17 partners from 7 countries, which first meeting concluded last week in Salzburg. The NIMBLE initiative, “Collaboration Network for Industry, Manufacturing, Business and Logistics in Europe”, aims at configure a collaboration network under the schema of a multi-sided B2B (Business to Business) network covering other B2B platforms, so that integration and data flow Exchange could happen in an open source environment, easing this way its future adaptation by sectors or geographical regions. 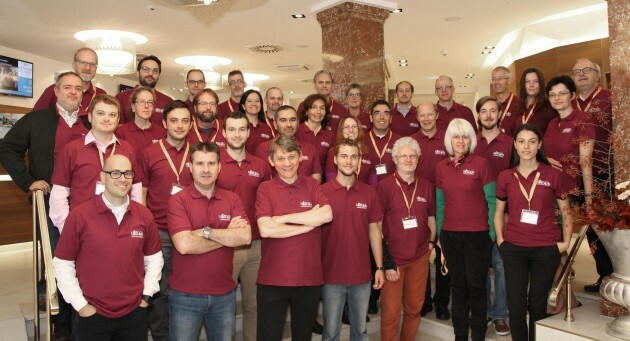 Representantives of the international consortium of the NIMBLE project, yesterday, in Salzburg (Austria). Among the benefits of this integrated platform, it should be remarked the cost reduction, the ease of locating raw materials and products (and derived from this, a more agile and efficient prototype designing, optimised logistics, and the accessibility to specialised contents to break the barriers to exportation, such as required documentation and certifications and any other information that avoids laborious and costly processes, thus allowing the entrance to new markets. The special attention payed to the product life-cycle to ease its recycling, reuse or final assessment is another relevant benefit of this platform. Data Exchange in networks is a critical aspect for companies due to the private and reliable nature of transactions, so NIMBLE will provide a secure and reliable system to operate trusting in the platform, in line with the Digital Agenda 2020, that considers networks for the sustainable innovation and fair competition. Also the Internet of Things IoT technology is considered in the proposed furniture scenario. Data protection is in the basis of the NIMBLE platform development, which will provide agile solutions based in the same architecture used in Industry 4.0 to boost specific “federations” of the platform (by sectors or regions), incorporating users from the beginning in order to be operational from the first year, from the three-year project duration. This way, the platform will progressively engage 1.000 up to 2.000 users, expected at the end of the Project, and it will work on 4 supply chains sectors: white goods, wooden houses, fashion fabrics, and child care furniture. AIDIMME will also provide technical support to this last use case proposed by MICUNA, focused on childcare furniture, in order to define the needs of supplying, logistics and management applicable to the operability of the company. FEVAMA will act as catalyst in the engagement of supply companies in order to cover the whole supply chain, from raw materials to semi-elaborated products or finishing, also including fittings. The three organisations will be in charge of incorporating the company to the platform, validating its functionality for the specific use case, which means a big challenge due to the great opportunities and solutions that provides to the business management, “in which process optimization is critical to be competitive today”, it has been pointed by the Operations Director of MICUNA, Jorge García. For his part, the FEVAMA Project Manager, Marcos Sabater, has stressed the importance of bringing such an integrative platform as NIMBLE closer to the companies, “which enables to unify criteria in the furniture industry easing the collaboration opportunities, which are greatly needed actually in order to generate a competitive production environment of quality”, has specified. MICUNA, FEVAMA and the Technology Institute AIDIMME start its participation in the R&D European project “Collaboration Network for Industry, Manufacturing, Business and Logistics in Europe, NIMBLE”, no. 723810 H2020-IND-CE-2016-17, with duration of 36 months and financed by the European Union within the Factories of the Future programme, in the research and innovation actions of the European Union. How to renovate and create new working spaces where users can carry out their daily activities with a high degree of well-being and efficiency is one of the objectives pursued by “Factories of the Future: Product-Service sYMBIOtic SYStems, PSYMBIOSYS”, a H2020 European project whose members met last June 22nd through 24th at the Metal-processing, Furniture, Wood, and Packaging Technology Institute, AIDIMME headquarters in Valencia. AIDIMME, as project partner, along with the other eleven representatives from six different European countries defined a set of queries about physical and emotional perception on the use of office furniture and the workspace “to adapt and generate new healthier environments for the development of the daily working activities”. During the meeting, AIDIMME researchers presented a network of wireless sensors placed in furniture located at the three selected pilot rooms. The values of these sensors along with the answers of the workers, will allow the definition of an ideal workspace customized to the needs of each company. The European consortium has developed a “Product Service System”, a platform visible from all devices that issues alerts to users and decision-makers within the organization, every time user defined thresholds are exceeded for a specific activity. In addition, a repository with all information accumulated by the sensors is stored and managed. All this information is preserved and follows the necessary privacy policies. © AIDIMME – Sensors used for the PYMBIOSYS project applied to furniture office to monitor a postural hygiene and correct environmental values in the workspace. During the meeting it was highlighted that all information gathered by the sensors was real, and perfectly complemented with the workers opinion, the latter subject to the individual characteristics of each person. The results of this research will make “the implementation of the product-service” possible. 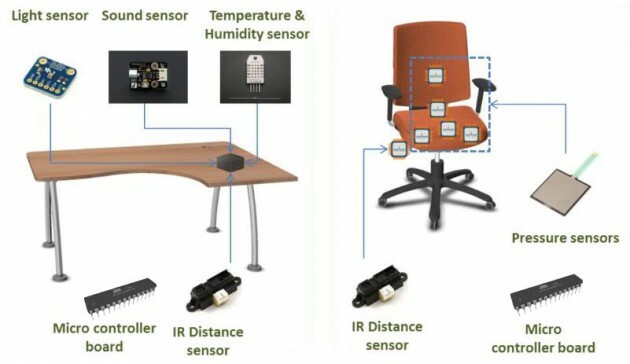 In addition to the direct benefit that company and workers have on their workspace, thanks to sensor monitoring, the office furniture manufacturer can also perform a follow-up of their product and measure the user’s experience for the designed furniture. Likewise, architects, designers, and interior designers can evaluate the environment and elaborate renovation proposals as well as new ideas for new designs. A fundamental tool for companies that want to track and monitor the products they design and sell, measuring the ergonomics as a user experience, and the worker’s sentiment as a vital experience during work, “with the intention of adapting the workspace to the social and productivity needs, and to provide a competitiveness resource applying over time this product-service concept”. Through specific sensors, heat, humidity, noise, or lighting values are constantly being monitored. In the same way, ergonomics are being tracked thanks to pressure, distance and tilt sensors, and user profiles containing anthropomorphic values which evaluate postural hygiene, issuing alerts if workers keep incorrect positions for a long time that could end up being damaging or harmful. The service also evaluates the sentiment of the workers and the brand value of the company, based on the furniture currently in use. This allows to analyze concepts such as functionality, comfort, esthetics and decorative elements among others. Management defines an explicit image and brand parameters that they want to portray. Once all workers, clients and social media opinions are gathered, evaluation of results can be achieved comparing both values. is present in several industrial sectors, such as video recording in airplanes, cutting machinery tools, textile, and office furniture. Each sector adapts the needs to the methods and technologies being developed jointly, as with AIDIMME’s sector, it will allow to design customized new spaces and furniture on demand. Summarizing, the project aims to improve the competitiveness of the European industries, generating and innovative environment with attractive solutions under a sustainable framework, outlining eco-design and integration of intelligent manufacturing technologies, where product-service will take a decisive role in line with H020 objectives. The Furniture, Wood and Packaging Technology Institute, AIDIMA, has participated in the R&D European Project FITMAN: “Future Internet Technologies for MANufacturing industries”, (http://www.fitman-fi.eu/) in the Future Internet FP7 program, financed by the European Union. The project has lasted 30 months and its achievements are now part of the new Industry 4.0. The final review of the project FITMAN took place on 26 and 27 of November 2015 in Brussels, obtaining a very good optimal final evaluation. FITMAN has been an initiative resulting of the agreement between 36 organizations from 11 European countries which catalogs it as a large and very challenging project. These companies belong to heterogeneous sectors such as aerospace, automotive, textile, construction, software engineering and furniture among others. The mission of the FITMAN project has been to provide the FI PPP Core Platform (The Future Internet Public-Private Partnership, a European program for Internet innovation, https://www.fi-ppp.eu/) with 10 industry-led use case trials in the different domains of Smart, Digital and Virtual Factories. The use case trials belong to several manufacturing sectors such as automotive, aeronautics, white goods, furniture, textile/clothing, LED lighting, plastic, construction, and manufacturing assets management. AIDIMA in collaboration with the UPV (http://www.upv.es) was in charge of the implementation of the furniture industry trial which was distributed in three use cases namely, Furniture Trends Forecasting for Product Development, Opinion Mining in Furniture Products and Collaborative Work for Product Design. These use cases addressed the need of decision makers in the furniture sector for automated tools that could really make an impact on their daily activities. For instance, trends analysts while searching for potential trends on the internet from well-reputable sources, analysts and designers while analyzing furniture customer opinions in Facebook and twitter, and managers and designers when getting together to develop new products based on all the information gathered before. It can be all summarized in one sentence: Innovative product design using the customer voice. The challenges faced were many such as the large amounts of unstructured sources with high volumes of information and no relation among each other that analysts must face, the manual processes being done, thus stealing “think time” from analysts, the lack of solutions to investigate final customers opinions, the absence of collaborative tools when designing new products and the potential to collaborate being reduced geographically (location dependent collaborative processes). AIDIMA succeeded addressing all these challenges thanks to their work on the FITMAN project. It should be noticed the participation of the company Diseños Tapizados Muñoz during the validation of the platform. General Manager, Antonio Muñoz can be seen in the videos addressing the furniture sector current difficulties and how FITMAN can solve them. Special thanks to DTM company for his participation. During the final review, the platform and the experiences of three use cases were presented to the reviewers as well as the achievements and conclusions obtained during the project. These were the increase of efficiency while searching for potential trends and therefore, the automated handling of that information, the time savings analyzing user and sentiment opinions shared on the internet by furniture buyers, the quicker decision making process which yields into more alternatives in designs, more proposals that can bel shared in a collaborative environment, a higher involvement of key players in all aspects of design process making such process richer and more effective. Focusing on the collaborative environment, it is important to highlight the workshop held in AIDIMA headquarters in Paterna before the end of the project on September 29, 2015. Among the attendees there were architects, designers, product development managers and furniture professionals as well as federations and commerce associations, furniture manufacturing companies and training centers. The presentation was arranged to offer an overview of FITMAN in general, and what’s behind it, and to present the work done during the project of AIDIMA and UPV and the components developed. As a result of this, several of the companies attending the workshop participated on a real testing of the collaborative platform. The participants were able to experience how all actors involved in the project could interact and share all necessary documents to carry out the task, such as the technical specifications for the sofa (dimensions, materials, etc. ), sketches, 3D designs, the product brief, video conference, notes, etc. The furniture, wood and packaging Technology Institute, AIDIMA, starts a research focused on analysing and evaluating the use experience of the employees about the office furniture, determining its suitability in a given working habitat, and evaluating to what extend products can be improved to increase the well-being, also providing manufacturer companies with an important tool to increase its customers loyalty. These activities are part of the 3-year European Project H2020 Product-Service sYMBIOtic SYStems (PSYMBIOSYS) within the Factories of the Future programme in which AIDIMA participates together with 11 partners* from 6 European countries, so European companies could be better adapted to the needs of its customer through the Product-Service concept, according to the Information Technology staff in AIDIMA. The objectives of the research and the integration of the results in the companies are complex issues –they remark-, but the main objective is to allow companies to make a track of the products they design and sell, measuring different factors such as ergonomics as a use experience and sentiments as a exceptional experience during the working activities, “with the aim of adapting the working environment to the social needs and the productivity, providing a competitive resource applying this Product-Service concept”, they precise. In general terms, the research expectations focus on the competitiveness improvement in the European industry generating an innovative environment with attractive solutions inside a sustainable framework, where the eco-design plays also an important role, and integrating manufacturing intelligence technologies, where the engineering of the Product-Service lifecycle plays a decisive role. Methods and technologies will be tested and validated in 3 different industrial environments: aeronautics, automotive and furniture. This last will be focused in the office furniture, where the AIDIMA Technology Institute will participate in the development of a system to detect needs, sentiments and improvements to design new spaces and elements adapted to an ad hoc habitat renovation demand of the working environment. The results of the project will be a set of industrial demonstrators, acquired knowledge, recommendations and guidelines to transfer the innovation and impact strategy produced by PSYMBIOSYS to other sectors and application domains in order to improve the competitiveness of the manufacturing companies in the European Union. The Furniture, Wood and Packaging Technology Institute, AIDIMA, has participated in the R&D European Project IMAGINE: “Innovative end-to-end Management of Dynamic Manufacturing Networks”, (http:// http://www.imagine-futurefactory.eu) in the Factories of the Future FP7 programme, financed by the European Union. The project lasted 3 years and it has finished in December 2014. The IMAGINE Project has addressed the problems related to the management of dynamic manufacturing networks, developing a collaborative platform for the production activities, considering also innovation aspects, which covers in a global and distributed way stakeholders, mainly SMEs, and equipment which perform production activities in a collaborative manner. Furthermore, methods for the management of these dynamic manufacturing networks have been implemented in order to provide a global and coordinated view of the information about the different systems involved in the whole value chain during the production activities. The definition and launching of “Living Labs” in the industrial sections previously introduced has allowed the implementation, testing, evaluation and dissemination of the ITC platform and the methodology proposed by IMAGINE. These five virtual laboratories have enabled the starting up of the developed methodology applying it to the corresponding industrial environments. © AIDIMA – Furniture Customization through the IMAGINE Platform. © AIDIMA – Orchestration of activities in the Dynamic Manufacturing Network. In order to validate the functionality of the IMAGINE platform, a “demonstrator” which covers two key aspects has been developed. On the one hand, the first part of the demonstrator shows the resolution of the problems associated to the selection of providers. The proposed scenario considers parameters such as the cost, time and quality of requirements in order to make an optimal selection. The second part covers the simulation of the dynamic manufacturing network operation, focusing on the impact produced in the values of the production Key Performance Indicators. It should be noticed the participation of the companies Muebles Romero S.A. and Diseño Tapizados Muñoz during the validation of the platform. Explanatory video about the project. The Furniture, Wood and Packaging Technology Institute, AIDIMA, has developed together with 8 European partners the R&D Project BIVEE: “Business Innovation in Virtual Enterprise Environments”, (http://bivee.eu) from the Factories of the Future FP7 programme financed by the European Union. The project lasted 3 years and it has finished in December 2014. During the days 25 and 26 of February 2015 the last review meeting of the European Project BIVEE has been arranged. The final evaluation rated the outcomes of the project with “Excellence”. The BIVEE project has developed a distributed and collaborative platform of ICT services with two well differentiated scopes: the Enterprise innovation management and the production processes improvement of the SMEs. The two main tools developed regarding both scopes are the VIF (Virtual Innovation Factory) and the MCR (Mission Control Room). The VIF component is the one in charge of supporting and fostering the innovation in SMEs, while the MCR component is in charge of improving the production processes of these companies. Both tools communicate with each other so that innovation and improvement ideas managed through the VIF are consumed to feed and enrich those processes managed by the MCR and vice versa. Both in the innovation area and the production area, tools developed are oriented in particular to collaborative environments where different and heterogeneous organizations participate in innovation projects or production activities in a collaborative way. Tools and experiences from the end users were presented during the last Project review meeting. This included the presentation of the impact produced by BIVEE both in the innovation scope (represented by Loccioni) and the production scope (represented by AIDIMA). The use of all the BIVEE tools was presented in both scopes in order to illustrate the functionalities and capabilities of the BIVEE environment. Regarding the production improvement scenario, AIDIMA illustrated the use of the tools in a Virtual Enterprise centered in the furniture manufacturer Muebles Romero, showing how BIVEE is able the detect and support the implementation of particular improvement in the process involved in the production network. Scenarios proposed by Loccioni and AIDIMA have been considered as success stories in the adoption of the outcomes achieved from a European Project oriented to the SMEs needs inside the industrial sector. BIBA – Bremer Institut Für Produktion und Logistik (Germany). CNR-IASI – Institute for Systems Analysis and Computer Science (Italy). SRDC – Yazilim Arastirma ve Gelistirme ve Danismanlik Ticaret (Turkey). TAL – Telemetry Associates (UK). UNIVPM – Università Politecnica delle Marche (Italy). IMAGINE will design and develop a novel, user-friendly networked manufacturing management framework, based on an associated engineering methodology that respects the interplay between the lifecycle of processes, resources and policies between cooperating consumers and providers, notably SMEs. IMAGINE’s concept is distilled in a set of six inter-related objectives, which are closely associated with steps necessary to craft the IMAGINE framework and associated lifecycle methodology and supporting ICT Platform. BIVEE (Business Innovation for Enterprise Environment) aims to produce an ICT environment to assist all the players in a virtual, networked enterprise to concieve ideas, test, prove, implement and monitor process improvement and real buiness innovation. BIVEE aims to use a number of new business models and ICT solutions for supporting and fostering innovation, such as Open Innovation, crowd-sourcing, new forms of social networking, that we need to seize and transform into a systematic framework at the service of European organisations. Innovation largely remains a “brain intensive activity. Bivee aims at building a distributed, collaborative, knowledge-intensive framework, where innovative business models, novel management methods, and emerging ICT solutions will be integrated to the benefit of interoperable virtual enterprises. The mission of the FITMAN project is, on one side, to provide the FI PPP Core Platform with a set of industry-led use case trials in the manufacturing domain, in order to test and assess the suitability, openness and flexibility of FI-WARE Generic Enablers; on the other side, to contribute to the social-technological-economical-environmental-political (STEEP) objectives included in the “ICT for Manufacturing” and “Future Internet Enterprise Systems” EU research roadmaps, by integrating FI generic and specific enablers with key business processes and enterprise applications currently running in Smart, Digital and Virtual Factories of the Future.